I recently mentioned a new book about Edgar Allan Poe issuing from the English Department at Missouri State University in Springfield. The volume (neither quaint nor curious but simply well done and interesting) was researched and written primarily by graduate students under the tutelage of professor James S. Baumlin who, with Craig A. Meyer and Ethan Prince, also edited the result. I wrote the foreword. I posted, on April, how you can obtain copies of the book (only $5.00) from the MSU book store. Now it’s time to further explore the world of this masterful author and poet with a public reading from his work. Jim Baumlin has put together a roster of Poe’s works that are well worth reading and pondering. The event takes place next Friday evening (April 12). Here is the program. If you live within driving distance and would like to spend an evening with Edgar Allan Poe, I hope you’ll consider it. 1. Film: Edgar Allan Poe (1909). Dir. D.W. Griffith. Perf. Barry O’Moore and Linda Arvidson. 2. Introductions by Lorraine Sandstrom, et al. 3. Thematic Introduction and Reading: E. A. Poe, “Alone” (1829). Perf. David L. Harrison. 4. Song: “Evening Star,” from Five Poems of Edgar Allan Poe (1986). Comp. James Poulsen. Soloist: Martin Wilson. 5. Reading: E. A. Poe, “The City in the Sea” (1831). Perf. Shannon M. Hays. 6. Trio: “Our Next Motion,” Witch Scene from Dido and Aeneas (1688). Comp. Henry Purcell. Soloists: Melody Gilbert, Brittany Griffin, and Doris Eng Chee Chua. With the MSU Opera Theater Chorus. 7. Reading: E. A. Poe, “Annabel Lee” (1849). Perf. Sara Docker. 8. Song: “Seal Man” (1922). Comp. Rebecca Clarke. Soloist: Angela Holland. 9. Reading: E. A. Poe, “The Bells” (1849). Perf. Donald Holliday. 10. Aria: “Queen of the Night,” from The Magic Flute (1791). Comp. Wolfgang A. Mozart. Soloist: Traci Prichard. 11. Reading: Excerpt from E. A. Poe, “Ligeia” (1848). Perf. Tita F. Baumlin. 12. Duet: From The Turn of the Screw (1954). Comp. Benjamin Britten. Soloists: Alyssa Phinney and Loriana Zavala. 13. Reading: Excerpt from E. A. Poe, “Shadow—A Parable” (1835). Perf. Darryl Clark. 14. Song: “When the Night Wind Howls,” from Ruddigore; or The Witch’s Curse (18). Comp. Gilbert and Sullivan. Soloists: Tylor Marsyla and Jared Swope. With the men of the MSU Opera Theatre Chorus. 15. Reading: Excerpt from “Poe’s Last Laugh” (2012). Comp. Professor Hestia. Perf. Tita F. Baumlin. 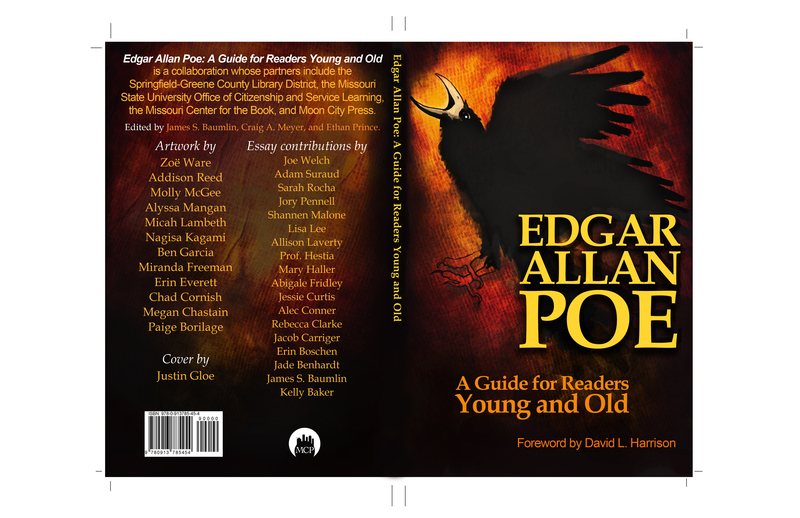 Laura Purdie Salas wondered if I might post the foreword to the newly released book about the life and work of Edgar Allan Poe. I asked my editor, Jim Baumlin, for permission and he graciously granted the request. So here it is. carrying beautifully written ideas around in my head. magic in it. It’s not just what you say; it’s also how you say it. this guy Poe was a poet in a class by himself. So what do you think I did? I memorized “The Raven,” of course. indelible images, and capturing an audience the way Poe does. remains well known and respected. —turn the page and go! The book is a private printing that is available at the Library Center in Springfield and at select Big Read events. It can be purchased (for $5.00) exclusively at PawPrints Bookstore in the Plaster Student Union on the MSU campus. (417) 836-8959. Here’s a new book just out. 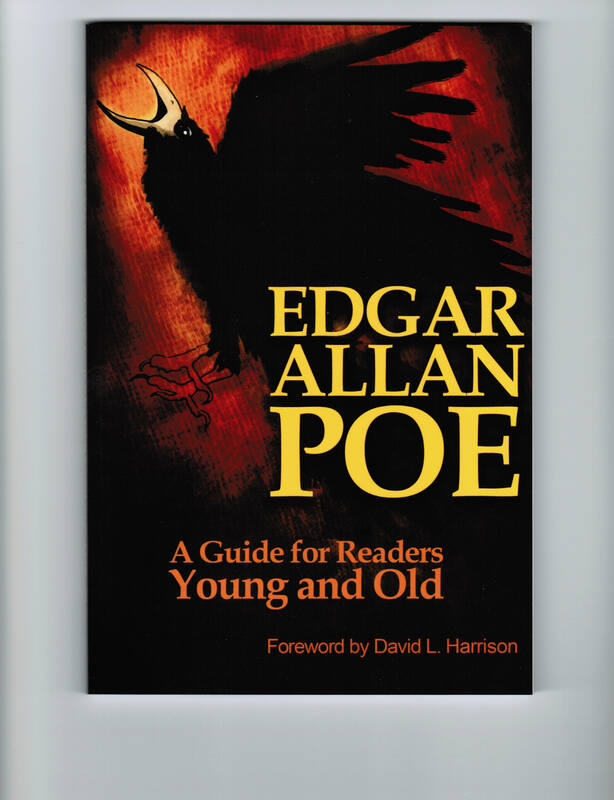 Edgar Allan Poe: A Guide for Readers Young and Old (co-edited with Craig A. Meyer and Ethan Prince). Foreword by David L. Harrison. Springfield, MO: Moon City, 2013. xii + 106 pp. This handsome volume was an ISL-designated class research/writing/editing project of ENG235: Critical Approaches to Literature, with artwork by students in Judith Fowler’s Art 101: Introduction to Drawing. The course was taught by Jim Baumlin, an English professor on the campus of Missouri State University in Springfield, Missouri. It was an NEA-funded project supporting the Springfield-Greene County Public Library District’s April 2013 “Big Read” on the works of E. A. Poe. The book is well researched and presented for an intended reading audience of middle school students and up. I applaud Dr. Baumlin and all of his students who worked long and hard to bring this book to the public. It was my pleasure to write the foreword.